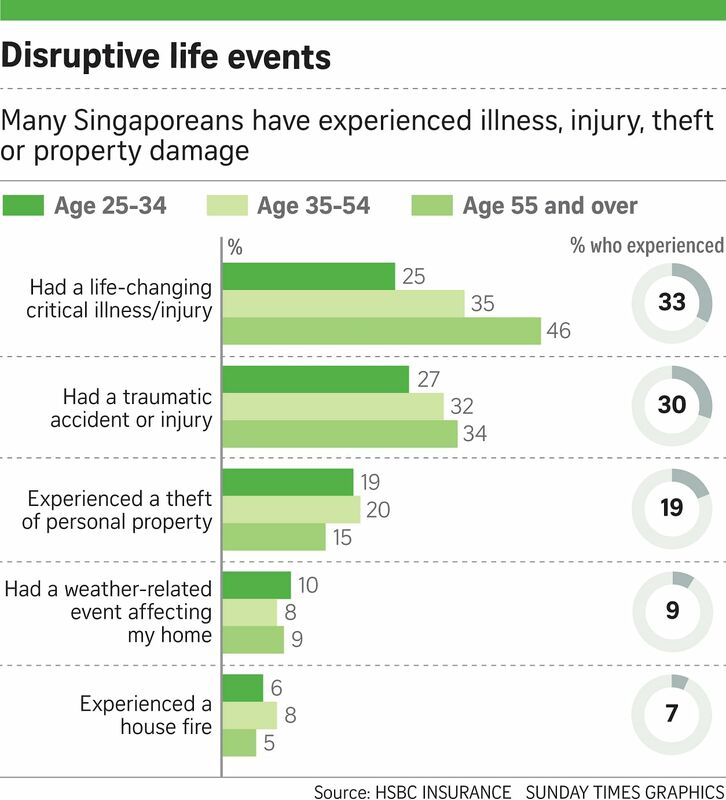 Most Singaporeans believe their lives are better overall than those of their parents, but many feel greater financial pressure and uncertainty than the older generation. HSBC's latest report in The Power of Protection series, Life changers, surveyed more than 12,000 people in 12 countries and territories, including 1,000 respondents here. They were asked to compare their lives to those of the previous generation and the next generation. About 65 per cent of Singaporeans think that they have more choices in life and over half (54 per cent) think they are better off financially. However, almost half (49 per cent) believe they are under more financial pressure than the previous generation while 51 per cent think that they have to take more risks with their finances. Mr Ian Martin, chief executive of HSBC Insurance Singapore, said the findings reflect the way global economies have been transformed over the decades. "While we benefit from the rise in personal income, we are also more exposed to unexpected and disruptive global events that impact the local economy and jobs. It is not surprising that the current generation, while living a better life, feel less secure than their parents," he said. He added that the increasing uncertainties highlight the importance of planning ahead so as to better navigate life's potential pitfalls. The report shows the No. 1 life changer is parenthood, with almost two-thirds (63 per cent) of Singaporeans citing childbirth as their most life-changing event. Marriage (57 per cent) and divorce or separation from a life partner (41 per cent) round out the top three life-changers for Singaporeans. When managing life-changing events, more than three in five people (63 per cent) cut back on their spending, while 59 per cent re-prioritised their spending. Slightly more than half (52 per cent) had to use their savings, while 25 per cent sought a loan or financing and 22 per cent sought financial help from relatives. Life-changing events also prompt people to think harder about their finances. Many people wish they had done things differently. With hindsight, 59 per cent of Singaporeans wished they had saved more and over a third (36 per cent) wished they had opened a new savings account. Over one-third (37 per cent) wished they had taken out a new insurance policy or increased the level of their existing one when they experienced a financially challenging life-changing event. 1. Plan for the events that will change your life. 2. Allow for the unpredictable. 3. Have a balanced strategy which includes protection, saving and financing. 4. Plan with the next generation in mind.